All eight schools participated actively in the program. Performances included, poetry and story telling by Richland Park Primary School, a skit by Belmont Government School about a curious lad who discovers a talking frog, while the Cane End Government School did a presentation on Journal writing. The other schools included in the Extravaganza were Evesham Methodist Primary School, New Prospect Primary, Calder Government, Richland Park Government, Richland Park Seventh Day Adventist Primary and Marriaqua Government School. 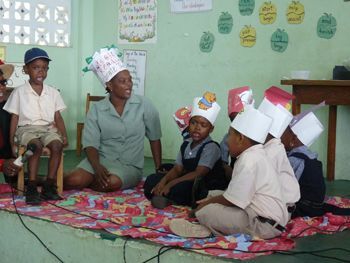 Carol Ross, Curriculum Support Officer in the Ministry of Education, expressed her pleasure at seeing the children exhibit their different literary skills they learnt at school. âOnce they can do it we want them to show it off,â she said. The Literacy programme is an initiative of the Ministry of Education to promote reading in Primary Schools and takes place in all schools during January and February of this year.